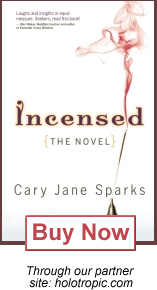 Incensed: The Novel is currently available in two formats, paperback and Kindle. More E-book versions will be available soon. To order in paperback from our sister website, use the “buy now” button one the book cover to the right. To order in paperback from Amazon, click here. To order for Kindle, click here.